Biodiversity Research Institute has collaborated with artists from across the country to bring two art exhibits to Portland, Maine: Conserve the Call and A Critical Balance. Both exhibits will be on display at the Portland Public Library Lewis Gallery, April 5th – May 25th, 2019. Funds raised during the event will be contributed towards conservation efforts. 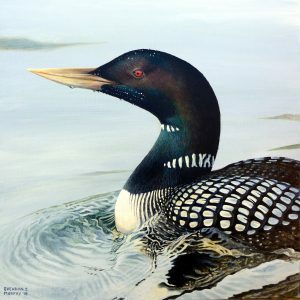 Our Conserve the Call exhibit features five species of loons that will be at the center of the 2020 International Loon/Diver Symposium. The artwork will be paired alongside information on current research and ongoing conservation efforts. Scientists estimate that 150-200 species of plant, insect, bird, and mammal become extinct every 24 hours. This is nearly 1,000 times the “natural” or “background” rate and, say many biologists, is greater than anything the world has experienced since the vanishing of the dinosaurs nearly 65 million years ago. Today many of the creatures that are familiar to us are at a critical balancing point. They might not be here for future generations to experience. 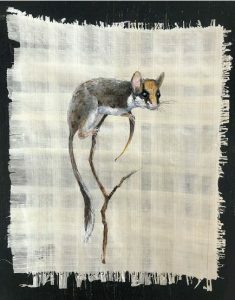 Ten New England artists have gathered to paint and exhibit a selection of species that are listed as endangered on the IUCN’s red list. As artists that have a dedication to the natural world, they have a unique opportunity to share their observations and use their art to convey both the beauty of these endangered species and the need to protect them. The intent of this exhibit is to use art to inspire and educate in ways that will reach beyond statistics, policy, and politics. The exhibit will include approximately 23 pieces of art painted to life-size and a catalog of the work. All work will be available for sale and a percentage of proceeds will be donated to the conservation of endangered or threatened species. Portland Public Library participates each month in Portland’s First Friday Art Walk throughout downtown Portland. Join us each month for the opening reception of a new exhibit. Light refreshments provided . There are often Arts & Cultural events held in conjunction with First Friday Art Walk throughout the library – check ahead to see what’s happening!